Today we moved the flock into position for easy access to the wool shed tomorrow. The sheep need to be dry for crutching or shearing, so I pop them in the holding shed overnight, just to be sure. I'd say they are well and truly over the Racecourse Grazing Area, despite there being quite a lot of good feed in patches still there. But the high ground where they like to hang out is getting pretty short and stale, so it was not hard to convince them to come with me down into the lucerne for a short feed, then into the Road Paddock, which is virtually ungrazed. The second part of the morning (and into the afternoon, as it turned out) was gathering the 9 rams from the 80 acre Lucerne Reserve where they've been enjoying the change of scene from their usual paddock. My initial plan was to come back and get the Polaris to make it easier to move them, but they were right in position for an easy move into the lower lucerne paddock, so Janie and Chance I took off on foot. We needed to get uphill from the rams, to keep them from breaking back to the top of the hill, so hiked up the steep slope above where they were. Of course, they knew perfectly well what we were up to, and high-tailed it to the far top corner. Because I don't work with the rams much, they are fairly wild and wily, and they led us a merry dance all around the boundary of the Lucerne Reserve. About an hour after we started, we finally had them where I wanted them--not 100m from where they were before the game began! The track for the ram chase is in green (getting to them) and yellow (coming back to the yards). We also had the good fortune to spot an echidna busily fossicking about on the hillside while we were trying to stay above the rams (video V3). Short-beaked echidnas (Tachyglossus aculeatus) hibernate in winter (something I've suspected for years, but just confirmed!) reducing their metabolism to save energy. They emerge in spring to mate, laying just one egg each year, which like other marsupials hatch at an early stage of development and are carried on the mother until about 6 months of age, when the young are able to fend for themselves. Monday we'll crutch all the sheep: clip the wool off their faces and bottoms, and shear the tails. That gets rid of the worst of the "dirty" (i.e. urine-stained) breech wool, and means when we shear them on Wednesday and Thursday there is little chance of the stained wool contaminating the good clip. As I have time, I'll send some images of shearing. I'm the "wool classer"--checking the integrity of each fleece--so I keep pretty busy! 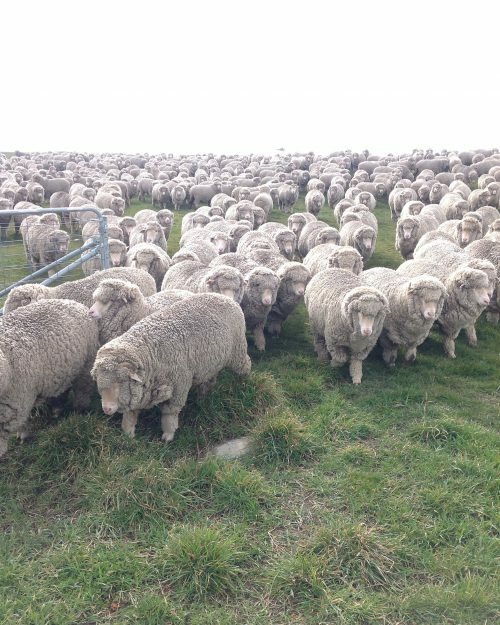 After shearing, the rams will go into the Stud Paddock, where there is good shelter, and the flock will go into the Lucerne Reserve, which has the best combination of shelter and feed I have available. Sheep can die of hypothermia after shearing it it's wet, windy and cold enough. We use "snow combs" for shearing, that leave about 1 cm of wool on the sheep, to help them stay warm for the first few critical days after shearing. If the weather gets too bad, I'll bring them back and put them in the wool shed overnight. Cajoling, calling, pushing, waiting... Whatever it takes. My wild, wily rams led us a merry chase all around the edges of the Lucerne Reserve. So glad to get the through the gate at the end!! ideo V4 above. There was too much wind noise--it was blowing at least 40 kph on top of the hill--so I turned the sound off on this last video. P2: And into the yards. The rams will be first into the shed tomorrow. Done for today and glad of it. My feet are ACHING! A slightly blurry family portrait (it was just about sunset yesterday, and taken with my phone). Centre front: Chance (with the kong) and Janie. Joker to Janie’s left. On Chance’s right, Pearl, lying down, then left to right standing: Flynn, Blaze and Jax. Pearl and Chance are focused on the kong–well really on me, willing me to throw it. Janie is focused on Chance, Joker on Janie, Jax on Pearl, Blaze on Pearl, Flynn on Blaze. So it’s surprisingly easy to get them to line up for a family shot!